We had always planned on eventually buying a car here in Cambodia. Life was so overwhelming when we first moved here that we decided to wait a while to buy a car. I ran errands around the neighborhood on foot. We found a tuk tuk driver who was honest and reliable (after a bit of trial and error). David got a bicycle. 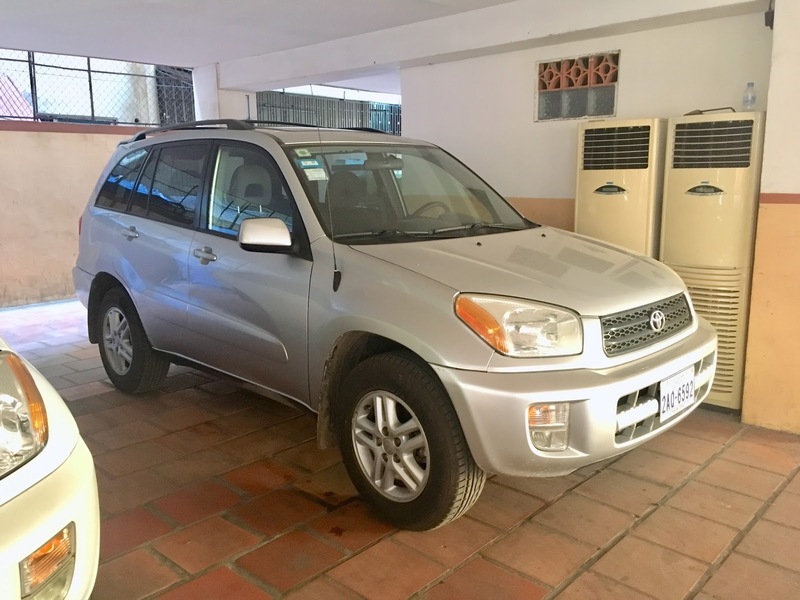 Yet, as life and ministry here has started to shift and as our partners and church moved to the outskirts of the city, we decided it was time to get a car. But just buying groceries in Cambodia can be complicated, so where would we even start when buying a car? I met another expat who used a “fixer” to help buy a reliable car. This fixer is an English “car guy” who speaks Khmer fluently and understands the complicated process of buying a car in Cambodia. We crossed our fingers that he would be all we needed to navigate this process. We were incredibly thankful for our fixer. He took us to look at some cars, poked at their insides and laughed when they let out scary noises. When he said, That’s not good, we thanked the dealer and moved on. When we found a promising car, he took us to Phnom Penh’s Olympic Stadium for a test drive. I hadn’t considered how we would do a test drive when traffic and small roads make reaching even 20 miles per hour difficult. He confidently gunned it around the parking lot, slammed on the breaks a few times and tested the suspension on the muddy potholes. Meanwhile, I sat in the back trying not to giggle at the absurdity/hilarity of doing all this in the middle of the day in a full parking lot. Our fixer fixed many things for us, but we still had to figure out much ourselves. We had to endure several lines and a frozen computer at the bank to pay the road tax. Then we had to figure out drivers’ licenses. We made two trips, each an hour long, to the Ministry of Transportation, while trying to figure out what the right documents are and what we had to do to acquire them. Once there, we wandered around the massive complex trying to learn the steps in the process (including lots of polite smiling and a ridiculously easy eye exam) and how to accomplish them. We had to do all this before I even started learning how to actually drive here! Since then I’ve learned how traffic works in Phnom Penh, how and where to get gas, and how to get a car wash to keep all the mud from clogging things up. I had to get better at backing into tiny parking places here because everyone backs into spaces—not my favorite cultural quirk. I even learned how to park the car in neutral so parking guards can roll parked cars around like slide puzzles to let other cars out (it involves a hidden button I never knew existed). Driving is still a bit overwhelming and draining for me, but now that the majority of the learning is done, I love having a car. I love being able to make long trips in an air-conditioned car instead of a hot, bumpy tuk tuk. I love getting where I want to go without telling anyone else where or why I’m going. Yet, the process of getting and driving a car here is a powerful reminder that there is always something new to learn. I’ve learned so many big and small things in the last two years since moving here. I distinctly remember on our very first full day in Cambodia, a year before moving here, having one main task for our morning: conquering crossing the street. Now I’m out there conquering the limits of my spatial reasoning by edging our little RAV4 through our neighborhood traffic pit. Similarly, Facebook just reminded me that I started Khmer language classes for the first time 2 years ago today. I knew exactly 2 words. This week I’ve spent hours upon hours having conversations entirely in Khmer at church, at the bank, at church and in class. Admittedly, it’s sometimes a bit frustrating how little I get to revel in the feeling of mastery in my life here. I work really hard to figure something out, to get good at it, to conquer the fear of it. Yet, I never get to feel like an expert—before the accomplishment can sink in, it’s back to square one with a new task. I do wish I could navigate my world with less thought and energy, but I do see the upside. First of all, constantly starting over with a new process or task to master keeps me humble. More than that, though, restarting the learning process again and again reminds me that almost anything is possible with enough work, help and prayer. Everything starts small. Three years ago I crossed the street. Two years ago I sharpened my pencils and went to class for the first time. Today I’m a traffic-driving, Khmer-speaking resident of the Kingdom of Cambodia, and I’m on the look out for what I’ll be learning and figuring out next.